WordPress hosting has become pretty popular these days, as more and more online entrepreneurs have found it essential to set up their own blogs. In these blogs they not only write content, but as well promote their latest products and services, such as e-books, for their audiences to get. WPEngine.com is a WordPress hosting company that has been around for a number of years already. Unlike other WordPress hosting services, this company offers a more hands-on approach in handling and managing client accounts, as it caters to individuals and companies who are not tech-savvy when it comes to building and making their sites live on the internet. A lot of famous brands have also grown to trust the services of WPEngine.com, such as HTC, foursquare, bonnaroo, Soundcloud, balsamiq, and Williams-Sonoma, to name a few. •	Tech assistance. WPEngine.com makes it a point to cover the tech needs of its clients, whether they are setting up new WordPress sites or are migrating their current sites to the host’s packages. They also make sure that the structural integrity of their client sites are safeguarded against potential hacks. •	Curated plugins and themes. WordPress has become a favorite CMS platform among bloggers and site makers because of its easy to use tools, including plugins and themes. WPEngine.com hence offers the best widgets and add-ons clients can use on their own WordPres sites based on other user experiences. This makes site customization a lot easier, not to mention very fun. •	Power tools. WPEngine.com also offers special power tools which advanced users can apply on their sites, especially when they have the knack in designing and making their own tweaks on their WordPress blogs and websites. •	Proactive backup. WPEngine.com makes it a point to back up their client data on a regular basis. They also have a one-click backup and restore option on their WordPress accounts at no extra charge. •	Scalable speed. WPEngine.com practically offers fast and scalable network speed, allowing clients enjoy greater incoming traffic. This is because through fast network speed, the faster the site loads, even if it is accessed by lots of traffic. •	Hack fixes. There are clients who wish to move to a new host because they’ve been hacked; oftentimes the new company they hire charges extra to fix the hacks. This isn’t the case with WPEngine.com, as their tech team offers hacking fixes and bug removals on migrated sites without the extra charge. •	Personal. Ideal for bloggers and small scale entrepreneurs, this package costs $29.00 per month, and includes 1 WordPress install, 25k visits per month, unlimited data transfer, and 10GB local storage. •	Professional. The Professional package meanwhile caters to bloggers who already have a big audience scale, and as well as small and medium-scale online businesses. This package costs $99.00 per month, and includes 10 WordPress installs, 100k visits per month, unlimited data transfer and 20GB local storage. •	Business. The Business package is a already a big plan that’s ideal for use on multiple sites and corporate pages. This package costs $249, with 25 WordPress installs, 400k visits per month, unlimited data transfer and 30GB local storage. •	Premium. The Premium plan is rather customized, but it offers unlimited WP installs and over a million visits per month. WPEngine.com is currently offering a promo to its new clients. Customers who pay 2 years in advance may avail of the 2 months free offer of the hosting service. There are no major downsides of using WPEngine.com, except that its package prices are also above average rates. But this is not seen as a drawback by many clients though, as the company offers highly commendable services to their clients. WPEngine.com has a customer support team that caters to the varying needs of clients, from their account status info, account updates and upgrades, design and layout issues, and other queries. The customer support team of WPEngine.com is also known for being very helpful to its clients, particularly those who are still learning the ropes of WordPress. Through their assistance, these clients get a better hand on their project sites, and publish them live with ease. Aside from the support hotline, WPEngine.com also has its own support page on its company blog. In this blog clients and potential clients get to know more about the latest updates from the hosting provider, the new plugins and themes developed within the WordPress community. To those who are not into calling the hotline yet, they may rely on the blog posts for more information instead. WPEngine.com is a beautiful WordPress hosting service, and it caters to both newbie and advanced site owners alike. 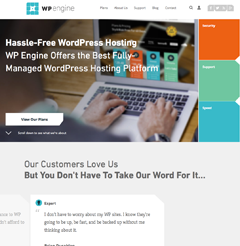 For one, WPEngine.com allows its customers to take care of customizing and creating content for their WordPress sites, as the company handles the tech issues such as setting the site live or removing bugs in its bigger accounts. Another great booster of WPEngine.com is that it is among the first hosting services that get the latest updates from the WordPress community. Being an upper-tier supporter of the community, WPEngine.com gets instant access to the newest tools such as plug-ins, widgets and themes which may be used by their clients in their own design experiments. Lastly, WPEngine.com has been proven to resist hacks and DDOS attacks, making it one of the most powerful hosting services in the market. Cleaning an WP site is never easy, and even some hosting providers refuse to handle such cases. Hence, if you’re looking for a WordPress hosting service that fits your needs and gives extra perks, then WPEngine.com is the one to go to.